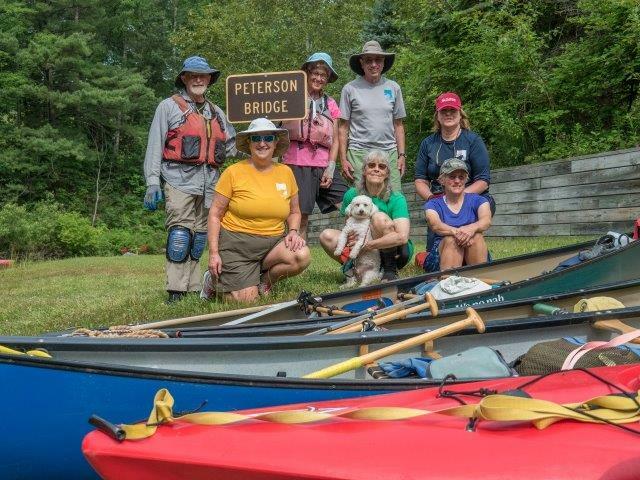 We had a superb group today: seven experienced paddlers - Jocelyn and Norm in their solo canoes, Linda, Gail and her friend Lynn in kayaks, and Lois & John in a tandem canoe (thanks to Mark and his super crew at PRPC - for both the canoe and the shuttle). The weather was excellent for river cleaning: warm enough so that getting into the water was no big deal, but not too hot. There were some clouds in the morning and sunshine after lunch. We had expected that the river would be filled with litter after the nice holiday weekend, but were pleasantly surprised that most of the stuff we hauled in appeared to be fairly old. Most beaches were spotless! We had to really search to find things, which were often in hard-to-reach log jams, or caught on tree limbs just below the surface. The only thing we found that was worth keeping was a nice water bottle. Otherwise it was the usual: lots of old beer cans (plus a few new ones), water bottles, mesh trash bags (those are tough suckers to get out when they have been tangled in trees for years), lighters, fishing lures, chip bags, jackets, shoes, containers from Jello shots, liquor bottles, and other things I didn't even know about. If alcohol was banned on our rivers, it would make a world of difference. By lunchtime we had only two bags of trash, and were thrilled that the river seemed to be cleaner than we had ever seen it. But we weren't done, and in the afternoon, things got rolling so that we ended up with six very full bags. We all had a great time! Gail and Lynn managed to pick up a sizable amount of debris at the site of a campfire, but mostly the recent users had not left that much litter. Linda was fearless going into dicey spots. Norm once again demonstrated his amazing canoe turning capabilities and eagle eyes. Sometimes the only way to clean out a log jam is to get out, and balance on the logs while getting trash. Here Lois steadies the canoe while John climbs out. Norm lent John his long grabber so he could reach everything, and Jocelyn teamed up to take the trash. Actually, there were quite a few other people out on the river today, and they were all sober. There were several family groups, some from out of state. Unfortunately a couple of car windows from those patrons were smashed during their time on the river, and purses were stolen. I felt really bad for the people, and was disappointed that their visit to our beautiful state had resulted in such an awful experience. Many of those folks had helped us in our river-cleaning efforts throughout the day, with one guy even climbing on shore to reach a log jam so he could help Jocelyn get some errant beer cans. We came around a bend, and here's this guy using Norm's extra-long grabber stick to assist our cause. Jocelyn recruited another paddler to help, and Norm loaned him his long grabber. An editorial note: Most trip leaders in our club have instructed paddlers to take their valuables (in dry bags) with them, rather than leaving stuff in cars. Ladies: leave your purse at home. Take car keys, wallet and phones with you - nobody has ever had their dry bag broken into. Mark Miltner says he doesn't lock his vehicles at river accesses. We may start doing that too; the only thing we usually leave in the car is our dry clothes for the trip home. About 1/2 hour after lunch, John & I were in the lead, with Jocelyn close by, when we came upon a family group (father and three girls, ages 8, 14 and 15) with a canoe that was totally broached on a rock. 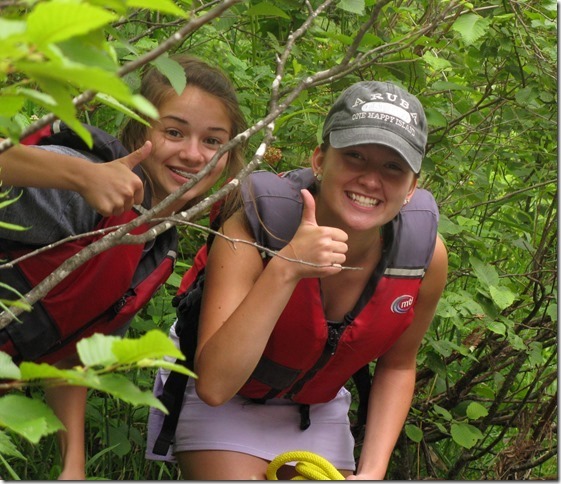 The two teenage girls had capsized in the incident. 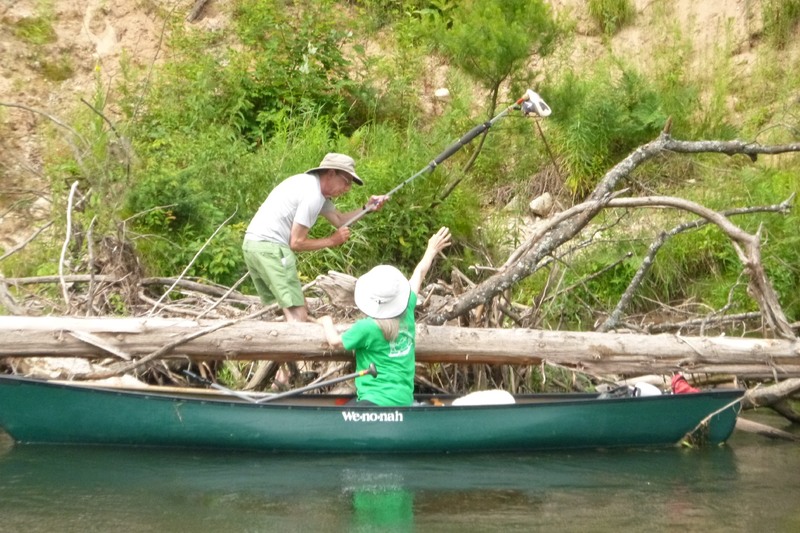 We leaped into action, and while I took care of the scared girls, John and the dad took care of the canoe. Nothing was lost (which was really lucky), and I insisted that the kids put their flipflops into the red mesh bag that was supplied by PRPC. 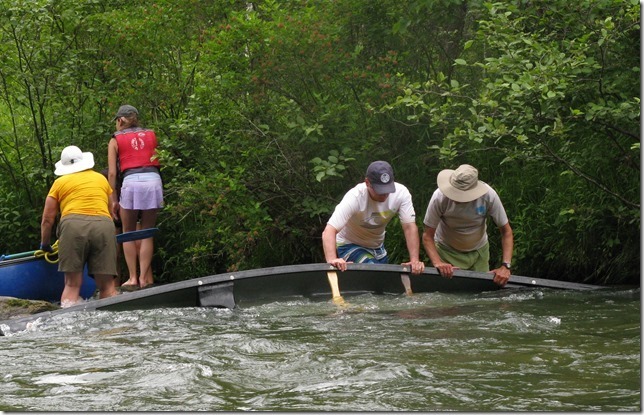 Meanwhile the guys managed to pivot the canoe around the rock so that the water had a chance to drain out. The only downside was that Norm missed the opportunity to help out. Everyone went on their way afterwards, and I think they made it to the takeout at Low Bridge without further incident. 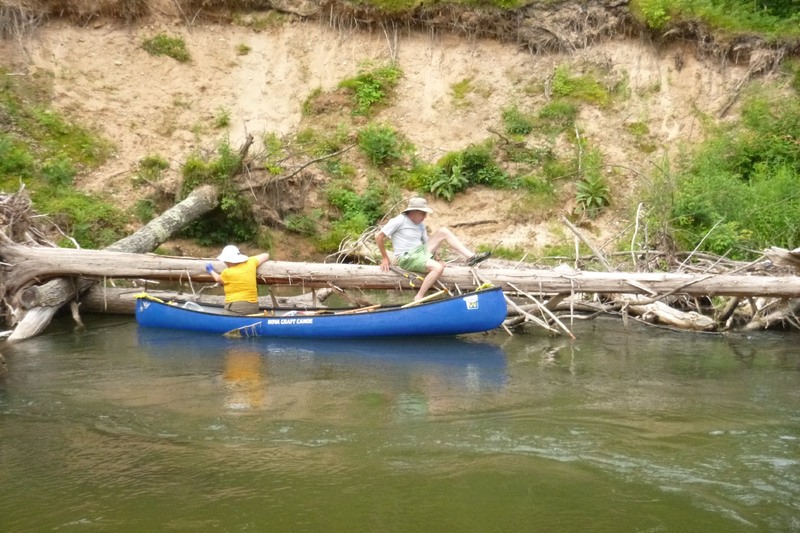 My conclusion: a tandem canoe with two novice paddlers is not the right combination on the Pine River. We came around the bend and saw a canoe pinned and a young lady standing on the rock holding the canoe. 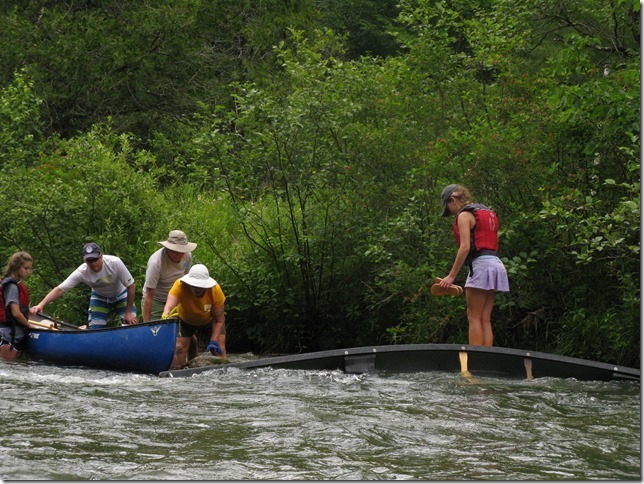 We pulled in behind the pinned canoe (we were in the blue canoe) and jumped out to help. First you get the victims into a safe place. John got Jim, the father, to come over and help slide the canoe off the rock. After we got it off the rock, we were able to empty it. 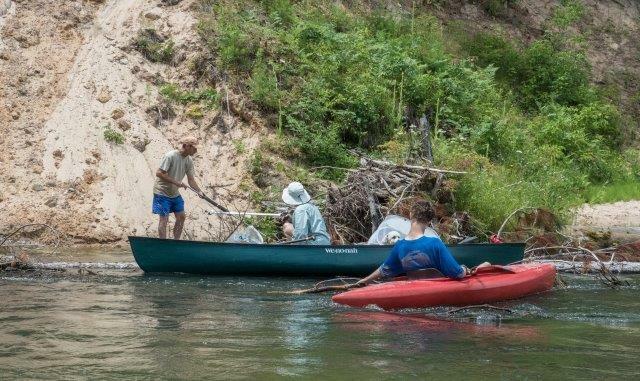 We left the river a lot cleaner than we found it, and we managed to get quite a few people involved in river cleaning. We may even have gotten some new club members! Quote of the day: "I don't want to mess up a new trash bag!"